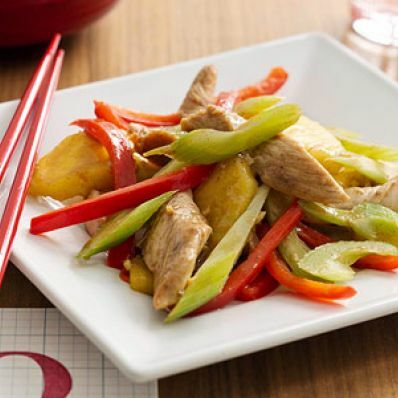 Juicy chunks of pineapple sweeten this chicken and vegetable stir-fry recipe. Serve with rice for an easy meal in less than 30 minutes. 1 of 3 Cut chicken tenders into 1/4-inch diagonal slices. In large bowl, combine chicken, hoisin sauce, cornstarch and five- spice powder. Cut each pineapple slice into 8 wedges. Place in a small bowl. 2 of 3 Heat oil in large skillet over high heat. Add ginger, celery and red pepper; stir-fry 1 minute. 3 of 3 Add chicken mixture to skillet, stir-fry 4 to 5 minutes or until chicken is no longer pink. Add pineapple mixture, chicken broth and vinegar to skillet. Cook 1 minute, stirring, until sauce thickens and pineapple is just heated through. Serve with rice, if desired.